Oct 23, 2018: franka_description is [not fully available for ROS Melodic](https://github.com/frankaemika/franka_ros/issues/34). Virtual joints are used primarily to attach the robot to the world. For the Panda we will define only one virtual joint attaching the panda_link0 of the Panda to the world world frame. 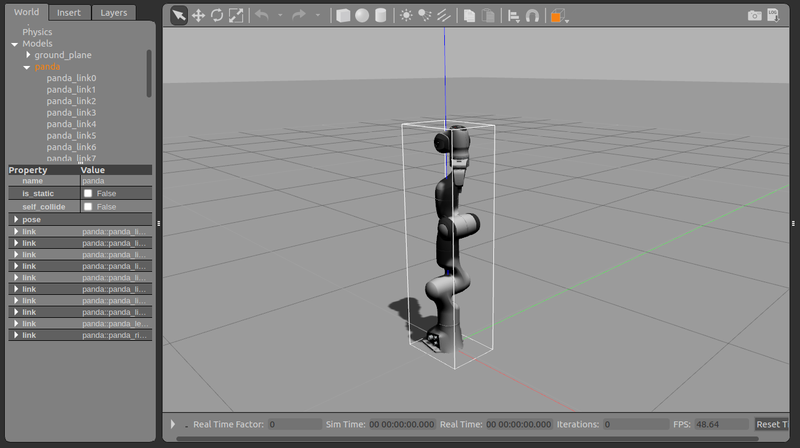 This virtual joint represents the motion of the base of the robot in a plane. Set the child link as “panda_link0” and the parent frame name as “world”. 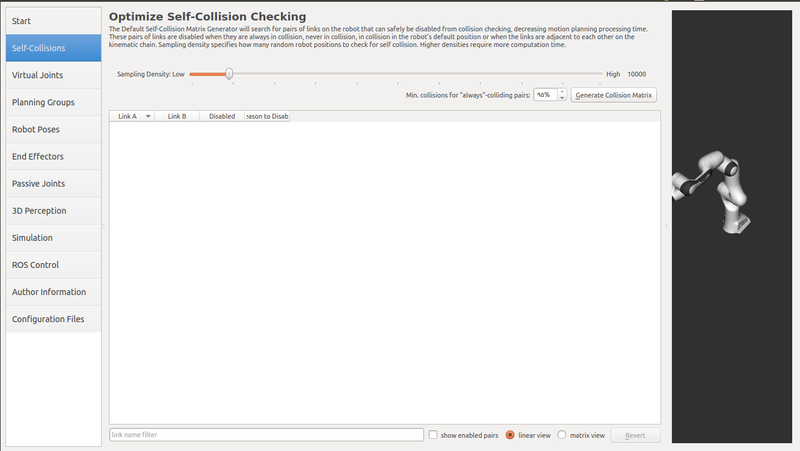 Click on virtual_joint, hold down the Shift button on your keyboard and then click on the panda_joint8. 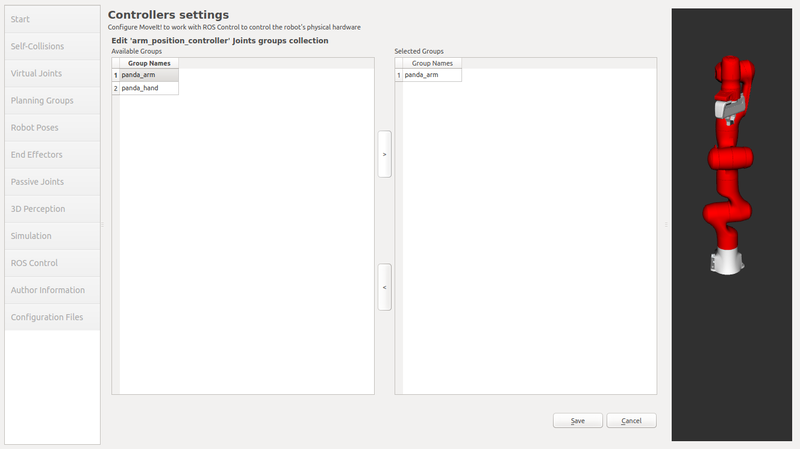 Now click on the > button to add these joints into the list of selected joints on the right. Choose panda_hand, panda_leftfinger, and panda_rightfinger and add them to the list of Selected Links on the right hand side. We have already added the gripper of the Panda. 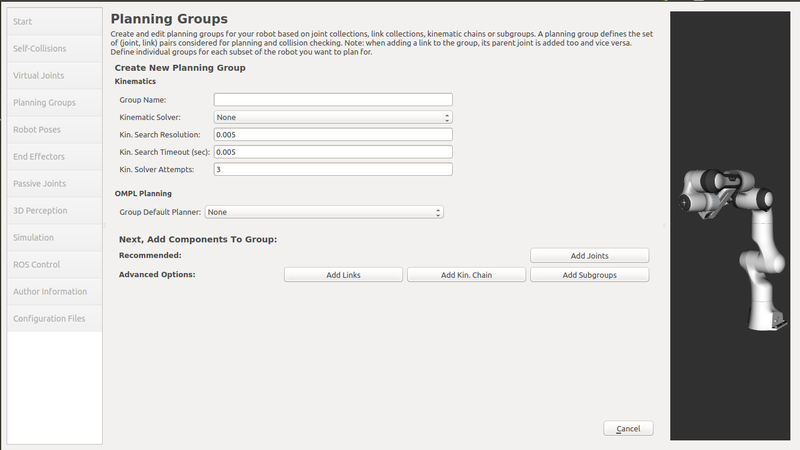 Now, we will designate this group as a special group: end effectors. Designating this group as end effectors allows some special operations to happen on them internally. Choose hand as the End Effector Name for the gripper. Select hand as the End Effector Group. 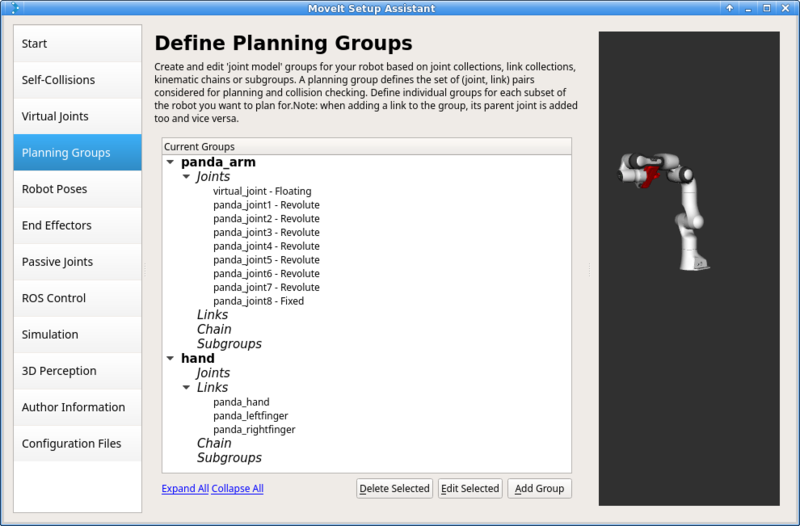 Select panda_link8 as the Parent Link for this end-effector. 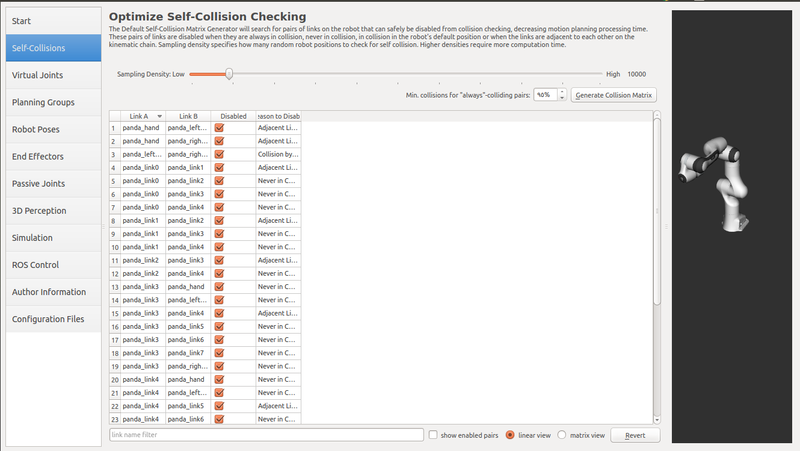 The passive joints tab is meant to allow specification of any passive joints that might exist in a robot. These are joints that are unactuated on a robot (e.g. passive casters.) This tells the planners that they cannot (kinematically) plan for these joints because they can’t be directly controlled. The Panda does not have any passive joints so we will skip this step. 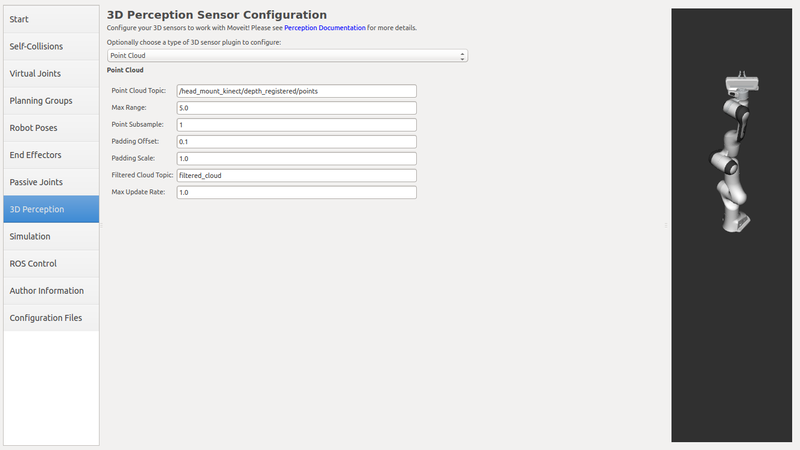 The 3D Perception tab is meant to set the parameters of the YAML configuration file for configuring the 3D sensors sensors_3d.yaml . 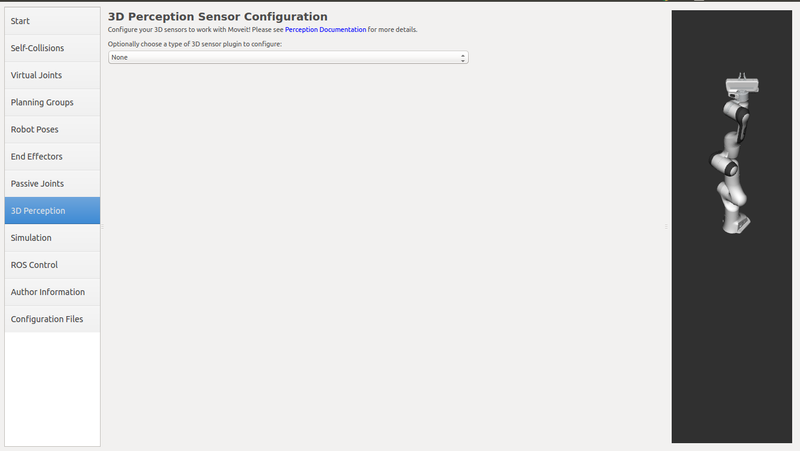 In case of sensors_3d.yaml was not needed, choose None . 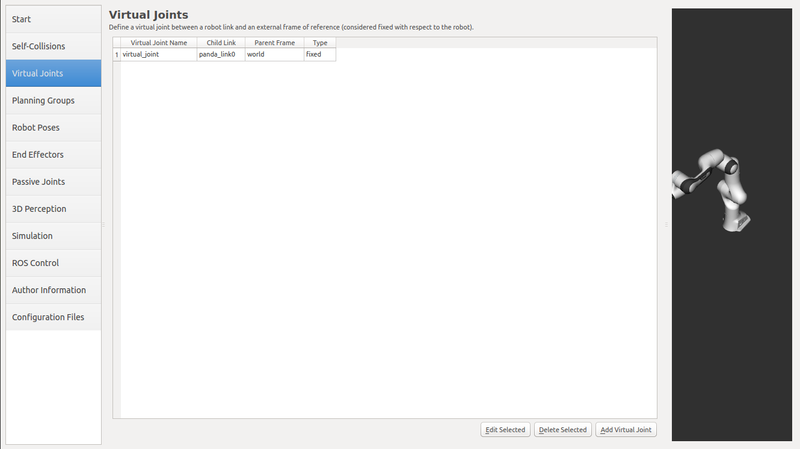 The Simulation tab can be used to help you simulate your robot with Gazebo by generating a new Gazebo compatible urdf if needed. You can use the generated robot urdf to spawn the robot in Gazebo in the following way. 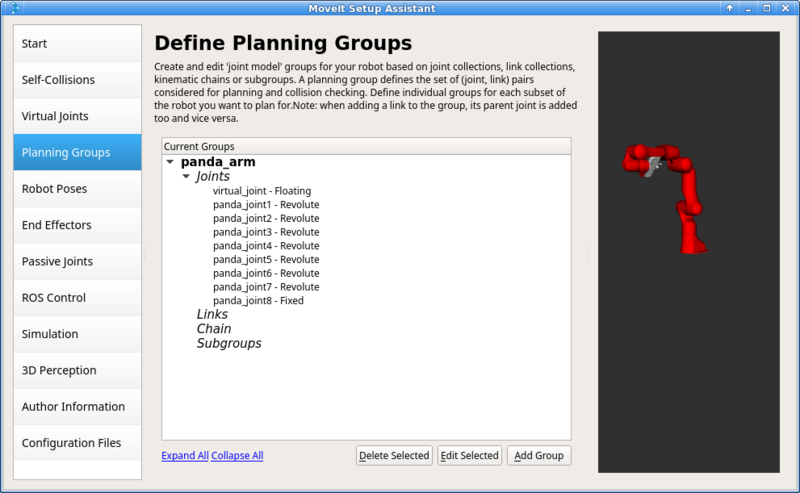 Choose panda_arm planning group to add all the joints in that group to the arm controller. 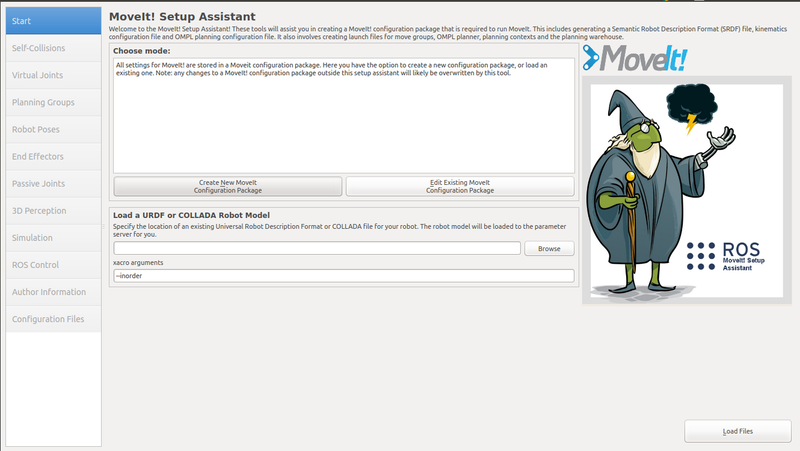 Click on the Configuration Files pane. 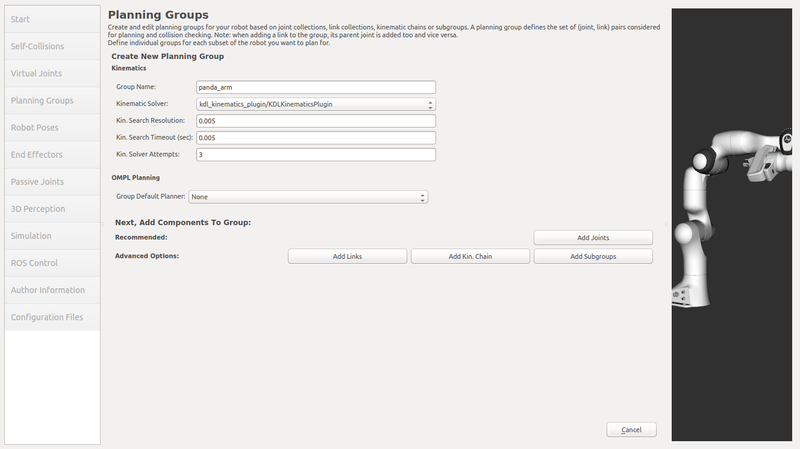 Choose a location and name for the ROS package that will be generated containing your new set of configuration files. 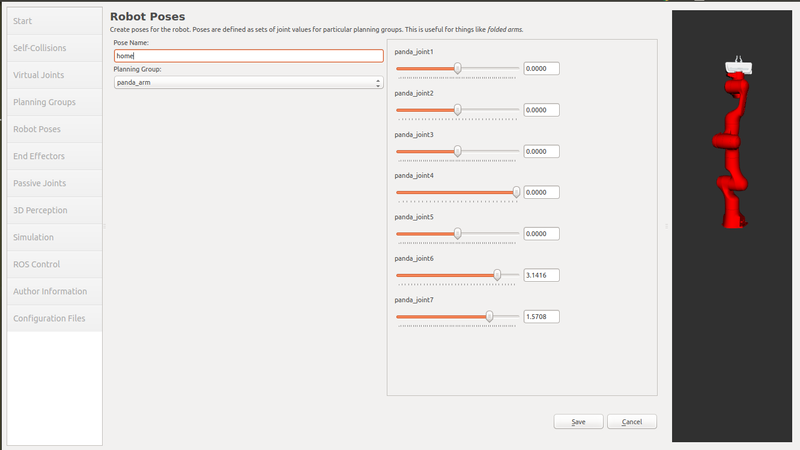 Click browse, select a good location (for example, your home directory), click Create New Folder, call it “panda_moveit_config”, and click Choose. 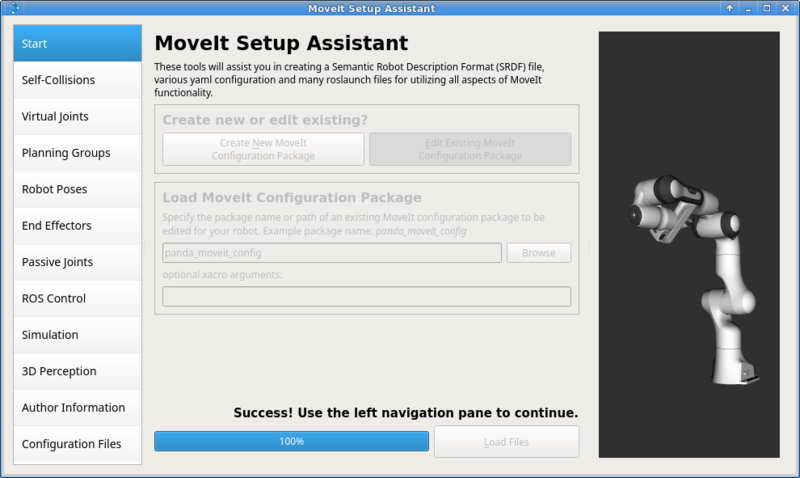 “panda_moveit_config” is the location used in the rest of the documentation on this wiki. This package does not have to be within your ROS package path. 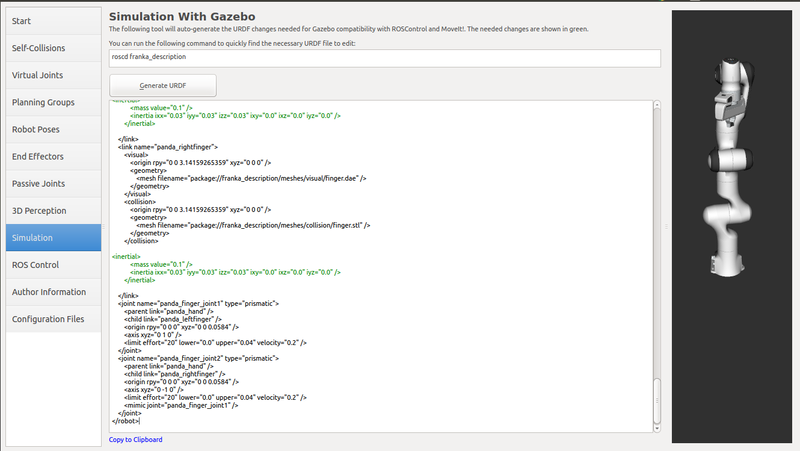 All generated files will go directly into the directory you have chosen. 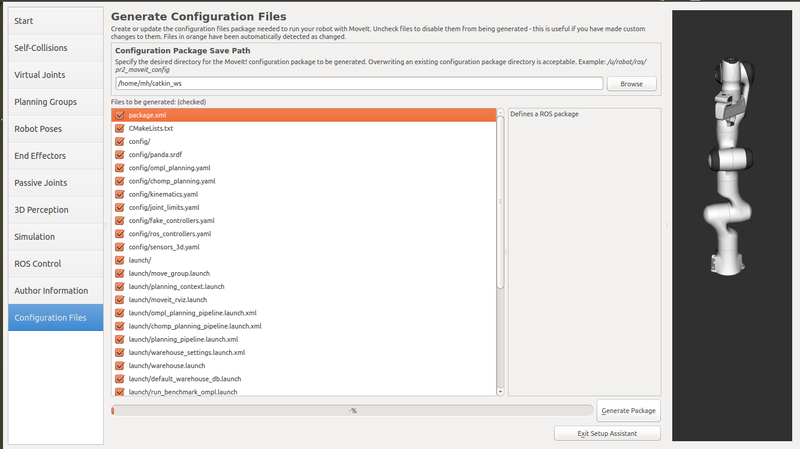 Click on the Generate Package button. 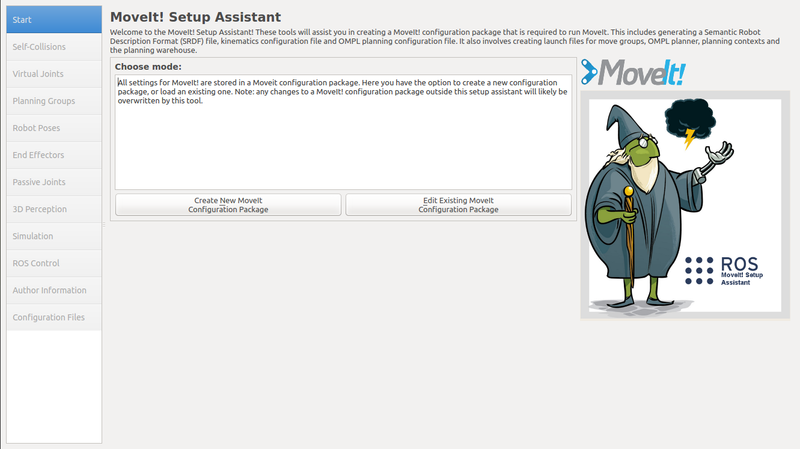 The Setup Assistant will now generate and write a set of launch and config files into the directory of your choosing. All the generated files will appear in the Generated Files/Folders tab and you can click on each of them for a description of what they contain.